When you are done with the creation of the survey, the natural step is to publish the survey in order to collect answers. The distribution page is where you see existing, and create new sendouts and links for your survey to distribute to your resondents. Where do I find Distribution? You can access it from the “Edit” mode of your survey. Go to the page called “Distribution” that is available from the menu on the left hand of the screen. If you are in the “See result or edit survey“ overview you can access distribution directly by clicking the button “Click here to view sendouts for this survey“-button on the right side, under the options of that specific survey (marked in the red square on the image below). What can I do on Distribution? 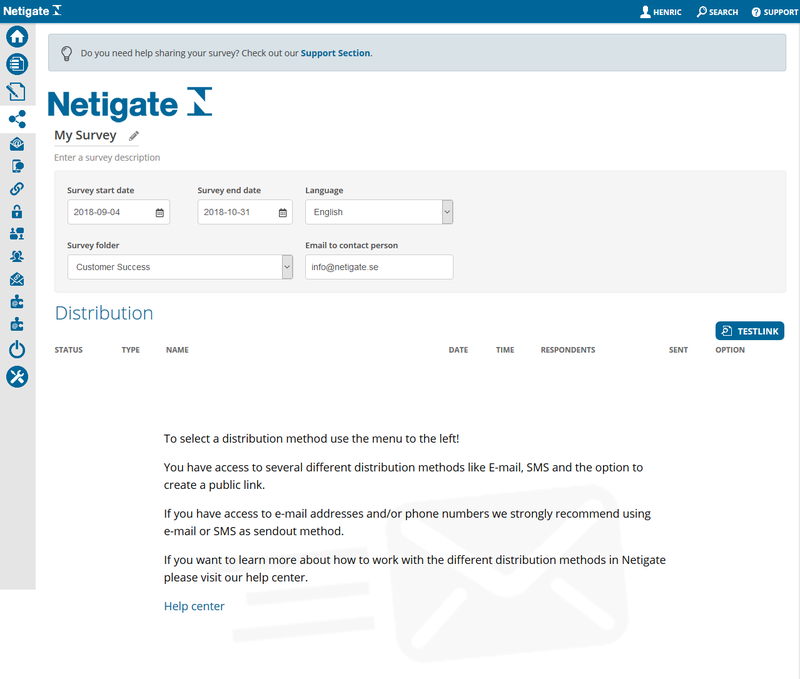 The distribution menu shows the various methods available for publication of the survey. The most common methods are sending out the questionnaire via e-mail or creating a general link that can be published on your website or in social media. You can combine multiple mailings for your survey so you can combine E-mail, Link and SMS on one and the same survey if you wish. The results will be recorded in the same report, regardless of which of these distribution methods you used. You do not need to create different surveys to reach respondents through different channels. The first time you enter the distribution page, this will be blank, as you have not created any mailing or links to the survey yet. On the top right, there is the possibility to use a test link on the survey to review and test the survey without registering any answers to it. E-mail sendout: When you have a set list of respondents that you want to reach we recomment you to choose to send the survey via e-mail. It is easy to set up and perfect for sending automatic reminders to respondents who have not yet answered the survey. You can read more about it here. SMS sendout: When you have a set list of respondents that you want to reach by phone we recommend you to choose to send the survey via an SMS sendout. It is easy to set up and perfect for sending automatic reminders to phone numbers who have not yet answered the survey. You can read more about it here. Survey link: The Link option can be used when you, for example, want to place the survey on your website or in social media. Any situation where you don’t necessarily know your potential respondents e-mail adresses or e-mail adresses the link can be used to publish the survey in an environment where it can be reached by a suitable target group. You can read more here. Logins: If you do not have access to the respondents individual e-mail addresses or mobile phone numbers, logins will carry a lot of the same benefits as e-mail or SMS surveys. Logins will provide a username, password and survey ID that will allow them to respond to the survey. You will also be provided with individual links for each of the respondents should you need to input data into the survey from paper survey for example. You can read more here. Embedded question: When you have one specific question that you want to embed in an e-mail or on a webpage. In order for the embed question functionality to work you will need a radiobutton quesiton (an NPS question for example) and in order for the question to be compatible there needs to be images associated with the response alternatives. You will need images in order for all mail clients to be able to correctly display the question. You can read more here. When you have completed your creation of sendouts, links and reminders there is a couple of things to keep in mind. If you have a sendout or link that is marked Red or Yellow, this means that your sendout is not yet valid to be sent. Red status: Your sendout have not been ordered. In order to activate it you will need to edit the sendout and go to “Order” to complete the sendout. Yellow status: Your sendout is ordered but the survey have not been activated. To do this you will need to go to the menu on the left hand side and click the option Activation. If you do not have any further additions or changes to sendouts that you need to do, you can go to “Home” to create new surveys, or “My Surveys” to continue your work with an existing one.